Featured News Why did Australia's megafauna become extinct? Why did Australia's megafauna become extinct? 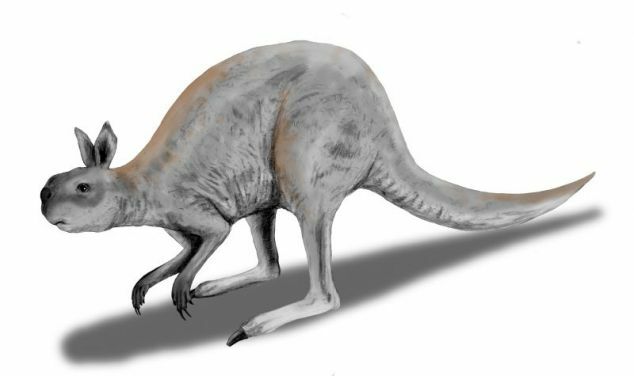 The giant kangaroo procoptodon is long extinct. (Pic: Nobu Tomura under creative commons licence). A James Cook University scientist is part of a team that may have unlocked the secret of why Australia’s giant land animals died out more than 40 thousand years ago. Professor Michael Bird said they’ve found clear evidence that Australia’s megafauna - animals such as the two-metre tall, wombat-like diprotodon, the 200-plus kilogram flightless bird genyronis, and the giant kangaroo procoptodon - were wiped out by humans. A new paper published today in the prestigious journal, Proceedings of the Royal Society B, refutes the competing theory that the die-off was due to a climate shift. Professor Bird said the review paper concluded that there was very little room for arguing that climate change was the reason for the disappearance of Australia’s megafauna, leaving hunting by humans as the probable primary cause. He said the period studied was so long ago they had to use a different technique to those used by most researchers of ancient history. Instead, the 16-strong team of experts went through all the existing data with a fine-tooth comb. “There was a very careful and exhaustive rescreening of dates and evidence. Dates that passed the tests were included in the paper and those that didn’t were chucked out. We then matched the physical evidence with known climate records from the period and the history of human movement into the continent,” said Professor Bird. It’s thought humans arrived on the Sahul landmass – an unbroken continent that is now New Guinea, the Australian mainland and Tasmania – 45 to 55,000 years ago. Professor Bird said the finding is globally significant as the arrival of people in Sahul was the first time in Earth’s history that modern humans reached a large landmass not already occupied by other hominids. He said this makes it an exceptionally valuable case in understanding the impact of humans on otherwise untouched ecosystems.